By Bob Smith: Tonight’s Keith Thurman vs. Danny Garcia match-up is a unique and special fight in many ways. For one, it is a rare welterweight unification fight between two undefeated fighters in their primes. There have not been very many of these. Secondly, it is a televised fight, and as a result has the potential to bring boxing back to free television rather than pay-per-view. Third, it is an intriguing match up, even in comparison with some good match ups and very fun fights to watch like Shawn Porter-Thurman, Garcia-Robert Guerrero, and Thurman-Guerrero. Like many, I have gone back and forth on who I favor and why. I will list some strengths and weaknesses of each and then let you as the reader decide who you think will win, based on the relative weight and importance the strengths and weaknesses will have. The breakdown is not very controversial. The key issue is what will be most important and why. 1. The first and most obvious strength of Keith Thurman relative to Danny Garcia is his athleticism. He is quicker, has better footwork, and has elite power, and in addition the “surprise factor” to his power that makes his punches all the more damaging. He is the naturally bigger man, and has fought at welterweight for longer, and will likely weigh more on fight day. So, Thurman has the edge in size and strength and speed and movement and punching power, and when the “surprise factor” is added in probably even more of a punching power edge. 2. The second advantage of Thurman is his versatility. He can stand and trade when he wants to in order to prove a point; he can jab and outpoint an opponent, he can get on his bicycle when he needs to do so, and he can even fight off the ropes and back up his opponent as well. He showed this versatility against the very tough Shawn Porter, and personally I think that the Porter fight will be tougher for him than this; however, in this fight, he needs to be smart, for Garcia is a more skilled and more cunning boxer than Porter, with nearly the same power. Thurman really has only these two advantages. In addition to being more athletic, bigger, faster, and a harder puncher, he also has fought at welterweight more often than Garcia. On the other hand, Garcia has faced the better opposition, overcome adversity more, and been on the big stage more often. Thurman hopes that his two major advantages will be enough to offset both his weaknesses and the strengths of Danny Garcia. This could be a tough sell. 1. The first weakness of Thurman (at least relative to Garcia) is his chin. He can be hurt, especially to the body. Luis Collazo is only a contender at welterweight and he did hurt Thurman badly in their fight -there is no question that he would have gone down from a similar shot from Garcia, who punches much harder and has better timing than Collazo. Undoubtedly Danny Garcia and his father Angel Garcia has several game plans for precisely how and when to strike at the body of Keith Thurman. He is also relatively weak with his chin – he was hurt more in his fight with Diego Chaves than Garcia was by Guerrero, Matthyse, or Peterson. 2. The second weakness of Thurman is his (relatively) less strong frame (i.e,., ring generalship). He can and does make adjustments, albeit not as proficiently as Danny Garcia does. However, even more worryingly, he lets his opponent dictate what kind of a fight it will be at critical intervals – he did this with Porter, he let it happen with Chaves, and if he does the same thing with Garcia he will lose, perhaps even by KO. Again, he is a good ring general, and he is more versatile, but in the past he has relied on his speed and power and let his opponent get the mental and tactical edge against him. If Garcia gets this mental and tactical edge, Thurman will lose. 1. The first strength of Danny Garcia is his ring generalship and big fight experience. He has been there before, and overcome all of the doubters. He beat Lucas Matthysse in a tremendous fight that most people picked him to lose. He took on and defeated Lamont Peterson and Robert Guerrero, and though he did win the questionable fight against Mauricio Herrera, he has always risen to the occasion against elite competition. It is worth noting that he knocked out Amir Khan, something that even Marcos Maidana could not do. But it is not only the big fight experience – Danny Garcia always finds a way to win. When he was losing against Amir Khan, he changed his game plan and did not get frazzled and had a dazzling victory. I just don’t think Thurman has it in him to do that. 2. The second strength of Danny Garcia is his timing. This could prove to be fatal for the hopes of victory for Thurman and his fans. Thurman likes to hit and run, and Danny Garcia has a tremendous left hook. If Danny Garcia can use his boxing experience to notice patterns in Thurman’s movement and time him properly, he will win, perhaps even by KO. 3. The third strength of Danny Garcia is his chin. This was the inverse of Keith Thurman’s weakness and was detailed before. This leads to the ironic situation where the bigger puncher (Keith Thurman) is also much more likely to get knocked out, in my opinion. Garcia’s timing is impeccable and his chin is likely the best in the welterweight division, while Thurman or Spence has the best punching power. The thing is, Danny Garcia really has no weaknesses. Sure, it would be better if he were more athletic, more flashy, and had better foot movement and speed and more versatility and was better able to deliver highlight reel performances with regularity. It would help his marketing if he had a portion of Adrien Broner’s personality and talked smack and did some showboating. But he does not need to do so. His record speaks for itself. He honestly has no weaknesses. Some boxers like Mauricio Herrera can get the better of him due to an awkward style and an off night, but this is the big stage, and Danny Garcia will be fully prepared for the fight of his life. They key issue is mental in this 50/50 fight. 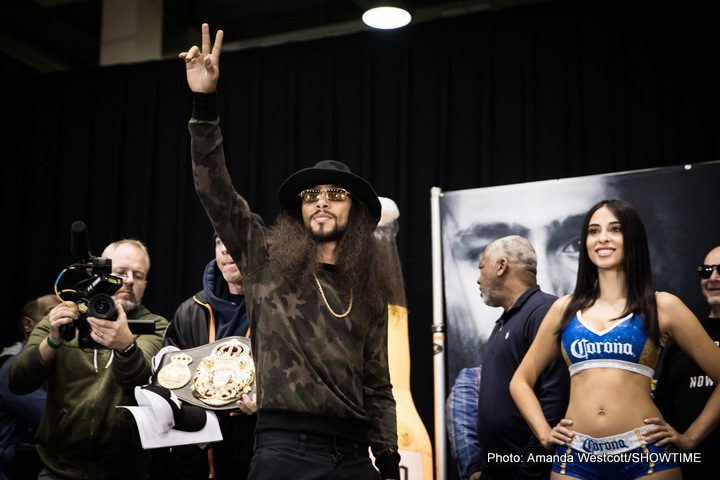 Which frame will win – the athleticism and speed and power and versatility of Thurman or the ring generalship, experience, and timing of Garcia? Thurman has always found a way to win up to this point, and so has Garcia. Will Danny Garcia be able to successfully cut off the ring against Keith Thurman? Will he be able to hurt him to the body? Will he be able to successfully make adjustments if he is behind? Will he be able to handle the power of Thurman when he throws unexpected shots from odd angles? In playing these scenarios out, I see two likely outcomes. One is that Danny Garcia catches Keith Thurman and scores a KO in the middle of the fight when he times Thurman who gets sloppy when coming in; related to this, a similar situation where he knocks Thurman down at some point in the fight and wins a close split decision. Another scenario is Thurman winning a moderately close decision on points as Garcia does occasionally hurt Thurman but is unable to score a punch that leads to a knockdown. I slightly favor the latter scenario, but I do think that if there is any knockdown in the fight it will be by Garcia. One scenario I definitely do not see happening is a Thurman KO win. He is cautious against skilled fighters and will use his power to undermine the ring generalship of Danny as well as his confidence and capacity to cut off the ring, rather than engaging in an all out war. So, my final prediction is a Thurman UD, maybe 116-114, or 117-113, or in this ballpark. Thurman will be pumped for the fight of his life, will rise to the occasion to have equal toughness to Danny Garcia, and will take his belts and the glory, in a relatively underwhelming fight compared to Thurman-Porter. He will then duck Porter and Spence, and go for big money fights, but that is another story…. Note that all of this and more can be had with my boxing prediction service, at a bargain rate of only $74.99 per month, for more info email bobsmithkoboxing2@gmail.com. This service includes breakdown of the major fights as well as request for specific fight predictions by email. Payment is accepted via paypal. Thank you and peace.